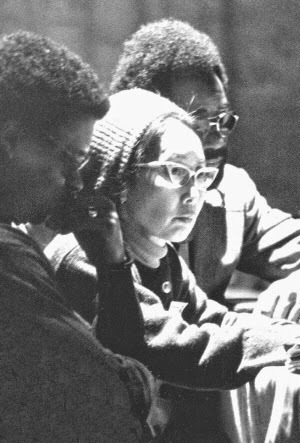 Yuri Kochiyama was born Mary Yuriko Nakahara in 1921 and raised in San Pedro, California, in a small working-class neighborhood. When Pearl Harbor was bombed, the life of Yuri’s family took a turn for the worse. Her father, a first-generation Japanese immigrant, was arrested by the FBI. When President Franklin Roosevelt signed the Executive Order 9066 ordering the removal of persons of Japanese descent from “strategic areas,” Yuri and her family were sent to an internment camp in Jerome, Arkansas. Due to these events, Yuri started seeing the parallels between the treatment of African Americans in Jim Crow South and the incarceration of Japanese Americans in remote internment camps during World War II. Subsequently she decided to devote her life to struggles against racial injustice. In 1946, Yuri married Bill Kochiyama, a veteran of the 442nd Regiment. The couple moved to New York City where her political activism would flourish. They had two girls and four boys; most of them would become actively involved in black liberation struggles, the anti-war movement, and the Asian-American movement. In 1960 the family moved to a low-income housing project in Harlem. Yuri and her family invited many civil rights activists, such as the Freedom Riders, to their home gatherings. They also became members of the Harlem Parents Committee, a grassroots organization fighting for safer streets and integrated education. In 1963, Yuri met Malcolm X and they cultivated a friendship that would strongly influence Yuri’s political career. Yuri had been listening to Malcolm’s speech when he was assassinated while speaking to the Organization of Afro-American Unity (OAAU) members. Yuri’s keen interest in equality and justice led her to work for the sake of political prisoners in the U.S. and other parts of the world in her later years. Yuri was nominated for the Nobel Peace Prize in 2005 for her tireless struggles against imperialism and racism. I never knew Yuri Kochiyama personally, but I knew of her work, her civil rights activism, her history, and her will - to make a better and fairer world - and it moved me and made me a better person. For a while I thought about going around the country, videoing people in the API community and I knew if I did, that I would have to see if I could sit down and meet with her - because it was Yuri Kochiyama. I just imagined sitting down, listening to her talk, the light on her face, relishing in a soul that I should forever be indebted to for what she had done and the courage that it took to do, and I just smiled at the thought of it. It makes me smile now, and I wish that it could have been a reality. You will be missed by many Yuri Kochiyama.